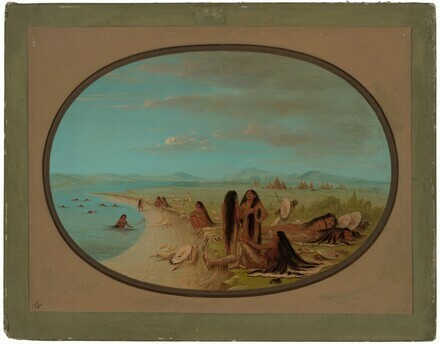 CROW WARRIORS BATHING in the Yellow Stone River, and drying their limbs and their long hair in the sun. The war paint with which their bodies and limbs are ornamented is not removed by the water, but will not bear wiping. Lewis and Clark's America: A Voyage of Discovery, Seattle Art Museum, 1976, no. 39, repro. Extended loan for use by Jean B. Gerard, U.S. Ambassador to UNESCO, Paris, France, 1982-1985. American Paintings and Sculpture: An Illustrated Catalogue. National Gallery of Art, Washington, 1970: 27, repro. American Paintings: An Illustrated Catalogue. National Gallery of Art, Washington, 1980: 55, repro. American Paintings: An Illustrated Catalogue. National Gallery of Art, Washington, 1992: 59, repro.